These petite howlite skull beads are perfect for Halloween but can work any time of the year thanks to the sophesticated shoulder duster styling and crystal dangles. And the best part is that they only require basic wire wrap skills and tools. Their casual style doesn’t require obsessive attention to detail so they are perfect for a less experienced wire wrapper. These finished earrings are over 4 inches long, but yours don’t have to be that long. 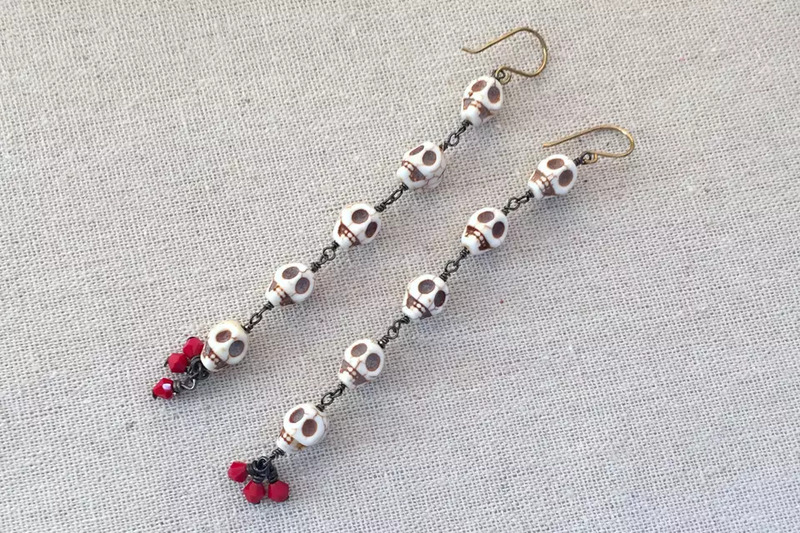 Wrap only three skulls for a shorter pair or one if you prefer a more dainty dangle. For whatever reason, drop earrings tend to feel more balanced with an odd number of beads – but don’t take my word for it. Try it out for yourself and see what feels right to you. 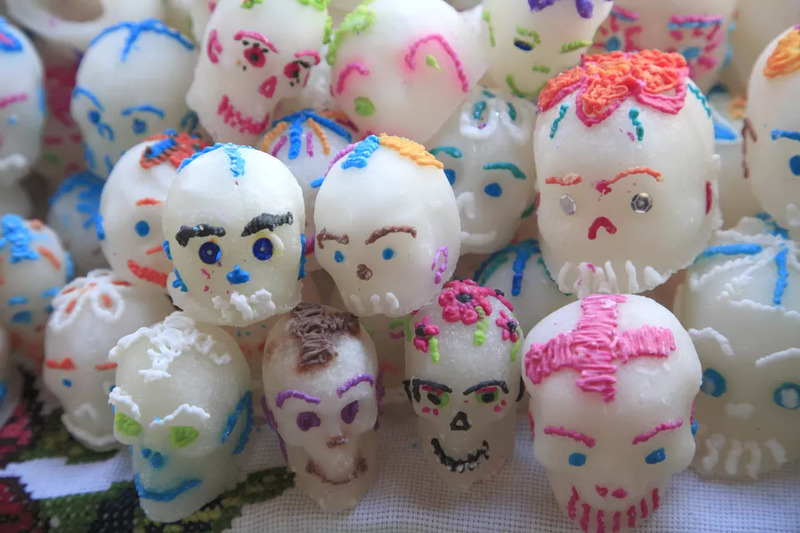 Celebrate the Day of the Dead (el Día de los Muertos) festival by making decorations, altars and traditional sugar skulls. There are many other crafty ways to celebrate the day. Day of the Dead crafts use bright and vibrant themes and can be a fun alternative to spooky Halloween crafts. Halloween will be here before you know it, which means it is time to start getting ready! Once you have figured your costume for Halloween, you will need to transform your home into a haunted mansion by decorating it with some creepy but fun holiday decor. ​By adding a creepy skull or two to your decor this fall, you can easily turn your home into a haunted mansion perfect for your Halloween party this fall. 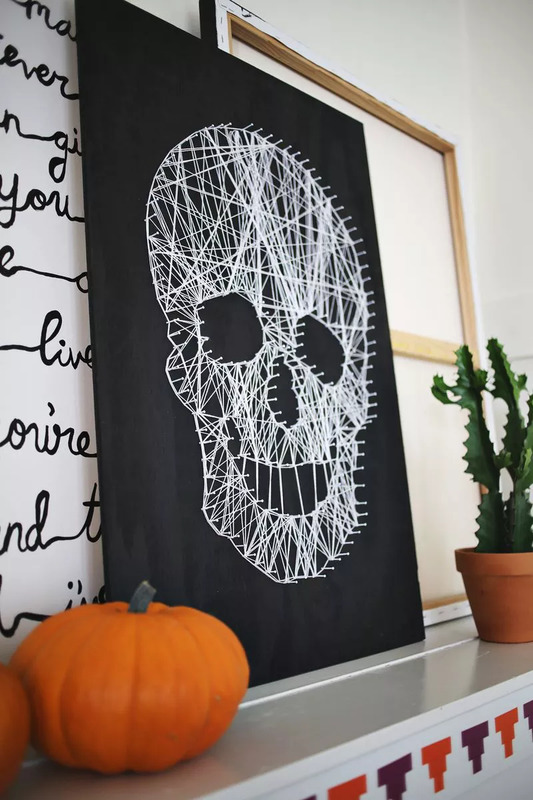 Here are 20 DIY skull ideas perfect to add an eerie feeling to your home this Halloween. Have you ever bought what seemed to be a perfect bedding set and found out it just didn’t work for you because the material irritated your skin or was just a chore to clean properly? Well, it’s happened to the best of us, even me. To avoid such pitfalls and ensure the best comfort, you should inform yourself about every material that bedding is commonly made out of. I designed this article to do just that – give you everything you need to know to make an informed purchase. So, let’s skip straight to it! Hey, today I want to share something interesting with you – stuff that every serious skull lover should know. There is so much more behind the skull emblem, from the ancient history to today’s urban/biker/death/metal theme in design. Perhaps you just discovered this and realized it is cool. Perhaps you are a devoted skull lover, with dozens of items and unique approach to fashion and style. Regardless, learning about skulls will make you a sophisticated connoisseur of the symbol. We all love them. We’re all bound to them, and many of us celebrate them. Our love for the skulls and in general, this symbol is stronger than ever before. Mostly related to death and power, skull is used in the modern culture and provided a never-ending source of energy and inspiration. Numerous villains, heroes, demons and godly creatures wore this symbol one way or another. In both good and evil, the skull has always been present as a powerful symbol. Today I’m listing the most powerful characters in today’s modern culture, coming from various sources: comics, movies, cartoons, and fantasy series. Some of them will be very familiar, yet others will definitely surprise you. Here they are – the most powerful skulls in the universe! I rated them from the weakest to the most powerful. Let me know what you think about the list, and would you set it up differently and how.